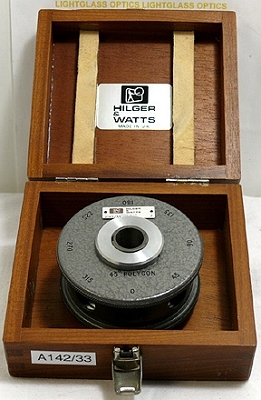 This Hilger Watts A142/33 45 Degree Optical Polygon is in excellent condition. Protected by its original factory mahogany case, it is in near-mint condition. This is one of the most useful Optical Polygons you can have, since its reflecting surfaces are located every 45 degrees, giving you access to surfaces at 0/360, 45, 90, 135, 180, 225, 270, and 315 degrees. The highly accurate polygon inside the case is accurate to +/- 1 arc-second, and because the optical element in the case is one piece, the accuracy is built-in and should not change. Calibration/Certification is available at extra cost.